When a restaurant prides itself on the quality of their beef, there is no reason to not turn your attention to it. District 10 at Suntec City is one such restaurant, especially when they are also particularly proud about their extravagantly expensive ($22K!) meat chiller for the dry-ageing of their meat. 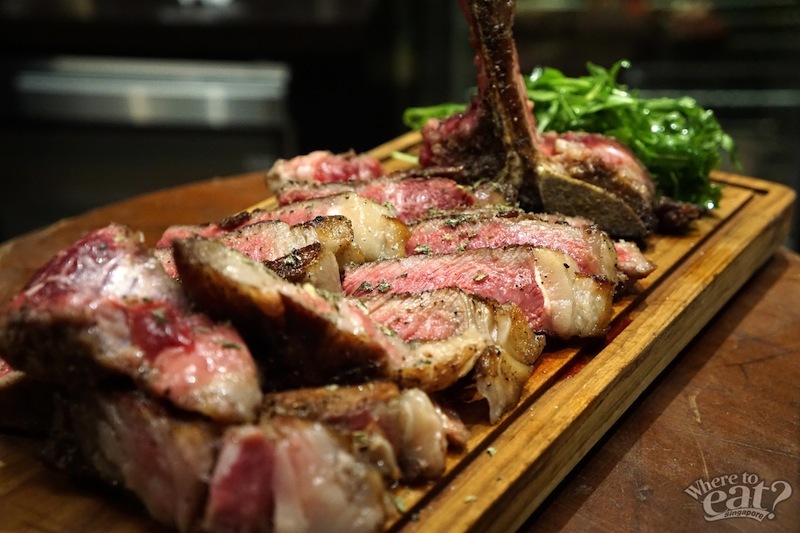 Different from their other outlets at UE Square, Star Vista and Clarke Quay, District 10 Suntec City focuses on being an upscale steakhouse that serves dry-aged steaks that are to-die-for. The dry-ageing process of meats takes up more time and effort than wet-ageing process, but we say the taste of it definitely pays it off. Dry-ageing process is a relatively simple, yet old practice that allows moisture to be evaporated from the meat’s muscle which helps concentrates the meat’s natural flavors and taste. 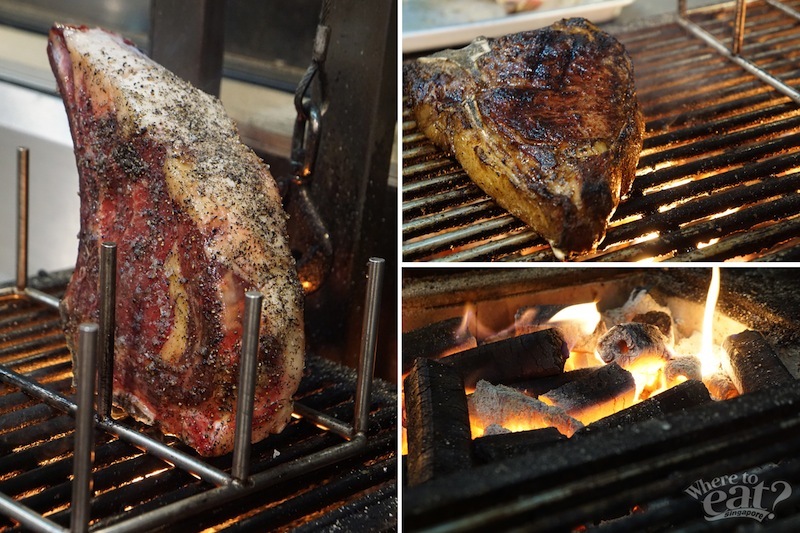 Also, it allows the beef’s own natural enzymes to break down the connective tissue in the muscle, tenderizing the meat. These procedures are completed in a temperature-controlled environment, where the pricey meat chiller comes in handy. 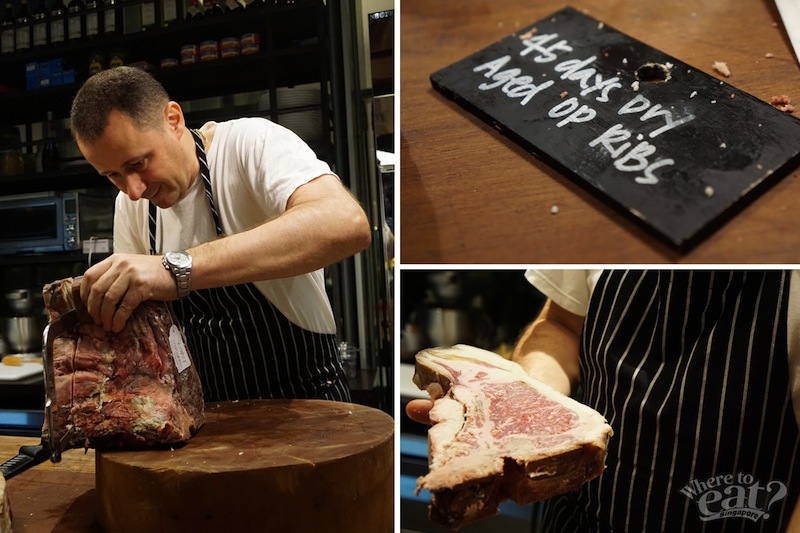 After the dry-ageing process is finished, the meats are first cut into thick chunks, then seared over hot coals until they are medium-rare, which is the doneness that Italian Chef Luca Pezzera insists on. The well-marbled 45 days Corn-fed Dry Aged US Prime Traditional Fiorentina Steak ($22++ per 100 gram), sports a slightly charred surface with a lovely warm red centre, also almost with no blood, thanks to the dry-ageing process. Sprinkled with just a dash of rosemary, sea salt and ground pepper, we say that’s how perfect steak should be done. 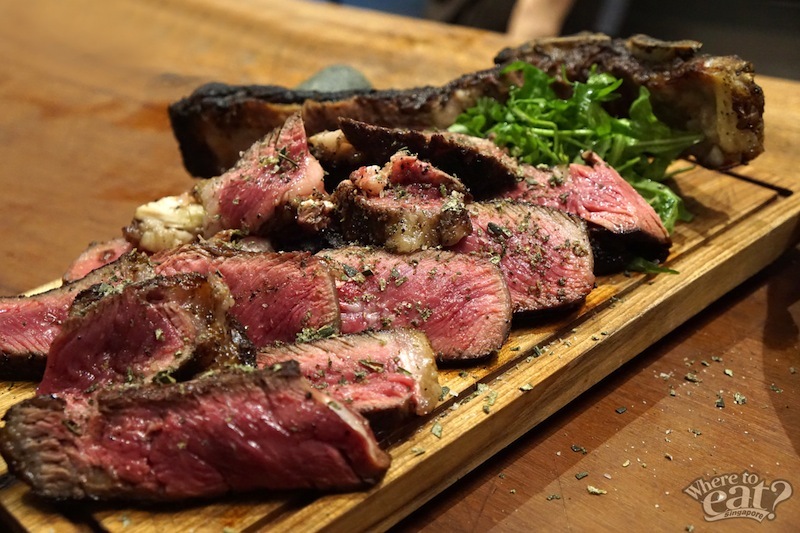 The other prime cut includes 45 days Dry Aged Corn-Fed US Prime OP Rib ($20++ per 100g), more commonly recognised as a bone-in ribeye, which has more fats attached to it as compared to the Fiorentina Steak. Marking beef as their main focus doesn’t render them any reason to make their appetizers less good. 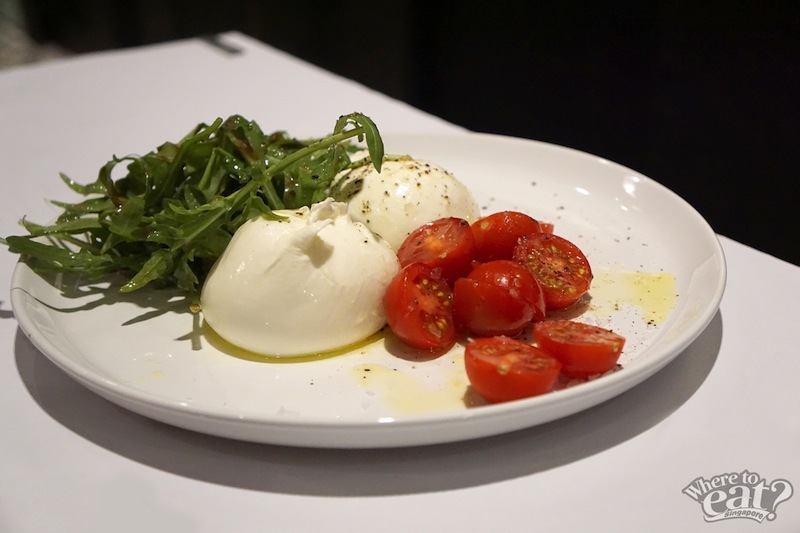 Puglia Burratina ($26++) is made with fresh Italian cheese, made from mozzarella and cream, with a side of organic cherry tomato-basil bruschetta. The cherry tomatoes they used are worthy of mentioning since. it was imported all the way from Australia. Expect a sweeter and juicier bite than regular cherry tomatoes. 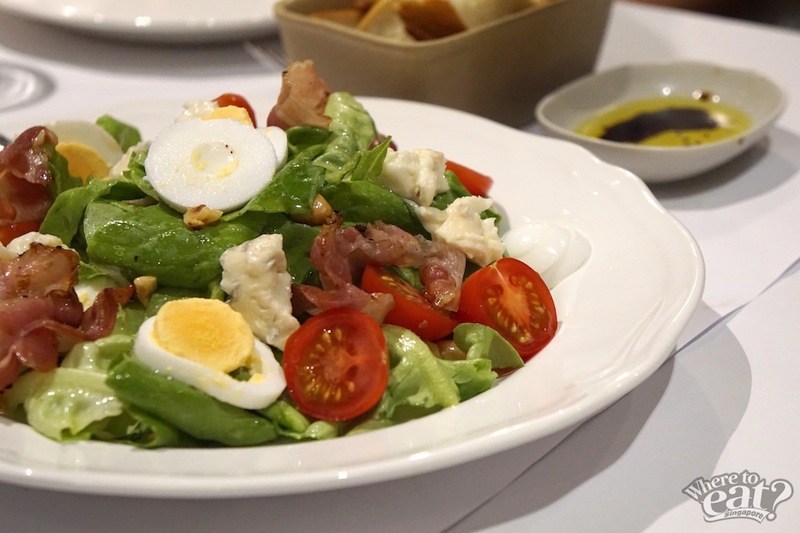 Prep yourself before the main star appears with a classic salad such as Butter Lettuce with Radish & Cherry Tomato Salad ($10++). A blend of pancetta, roasted hazelnuts, Gorgonzola & egg, it is refreshing and light so you wouldn’t need to worry for your stomach space. This unapologetically good appetizer, Thinly Sliced Roasted Veal Loin with Light Tuna Sauce ($24++), perfectly combines the taste of meat and fish. 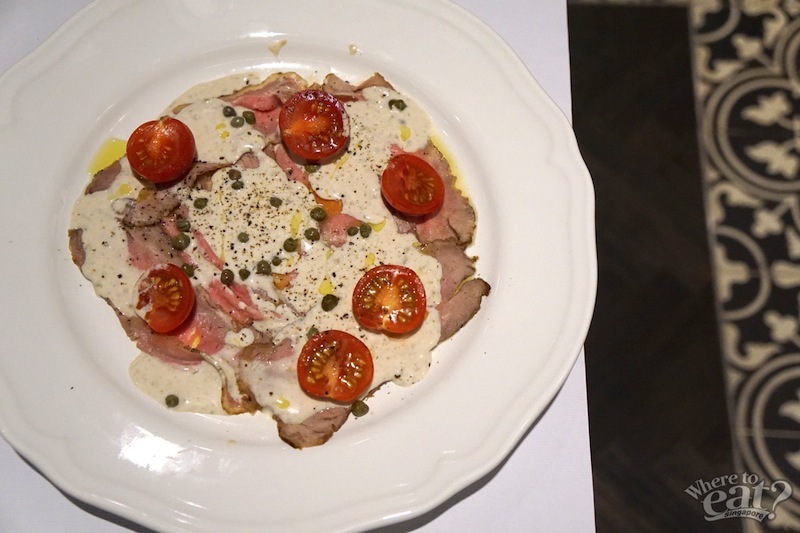 Thin slices of roasted veal loin drizzled with a flavoursome tuna sauce, it is almost as satisfying as a stand-alone meal. 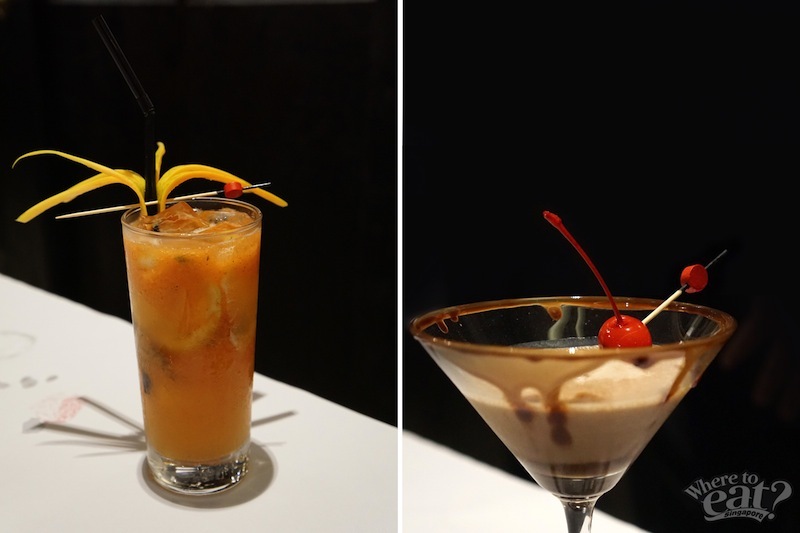 For those who can’t live without a dessert after a meal, lucky for you District 10 boasts an in-house dessert chef who invents his own special dessert recipe. 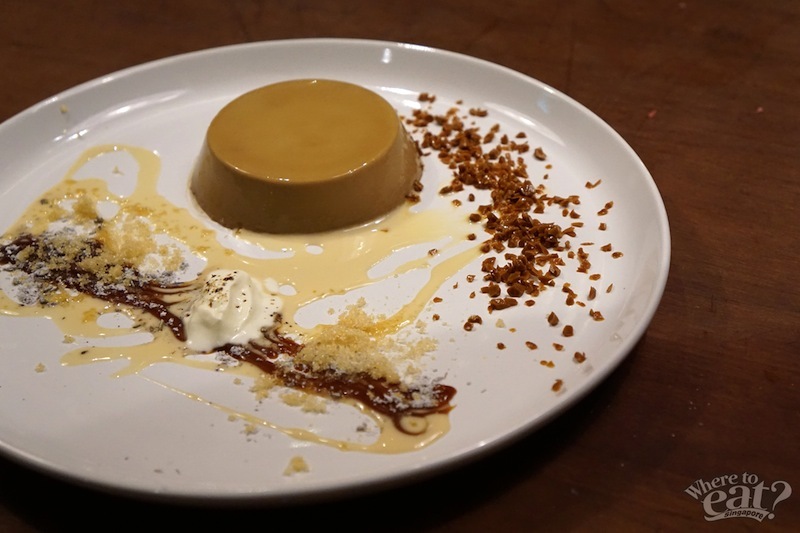 Such example includes Double Espresso Pannacotta with Vanilla Sauce ($12.00++) is a soft-textured jelly-like dessert with an intense flavor of double espresso. 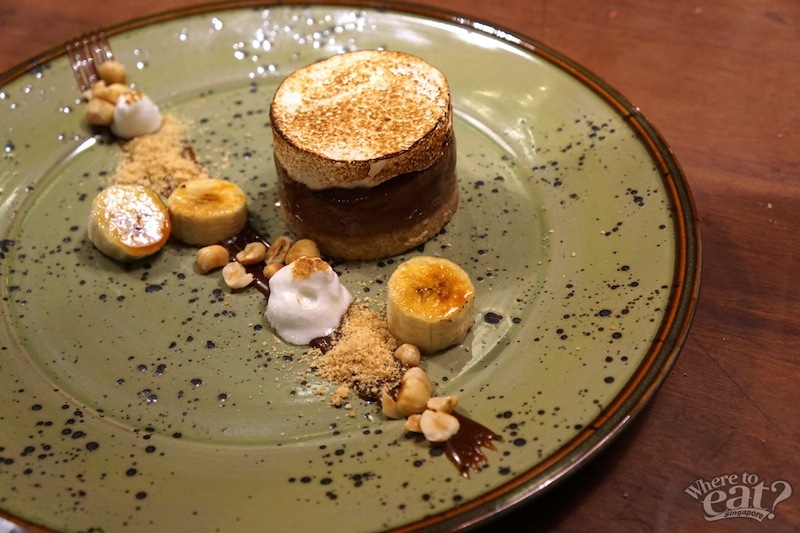 Similar to the Double Espresso Pannacotta with Vanilla Sauce, the Bitter Chocolate – Marshmallow Fluff with Caramelized Banana ($14++) features an original taste of bitter chocolate that is sweetened by caramelised bananas. What makes it special is the marshmallow-ey fluff on top of the bitter chocolate cake that reminds us of the texture that you find in meringue. Beef steaks might not necessarily has to be paired with only wine, District 10 invents and made their own signature cocktails that would go well with their food to create a chemistry that are hard to find. One of their signature cocktail, Fruits of Angel ($18++) is a blend of Plantation Original Dark rum, homemade papaya syrup, fresh lemon juice, thyme and with a dash of cinnamon powder. The other cocktail, Peruvian Handshake ($18++), carries Encanto Pisco Achlado, fresh pineapple, fresh lime juice, sage and soda would make a refreshing combo with their steaks. District 10 at Suntec City Tower 2 is the newest chains amongst the other 4 of their outlets, with the rest located at UE Square, Star Vista and Clarke Quay. The indoor space is fairly compact with a relaxed ambience suitable for a group of friends if you’re looking to indulge a little, and also they have quiet romantic alfresco seats for dating couples. 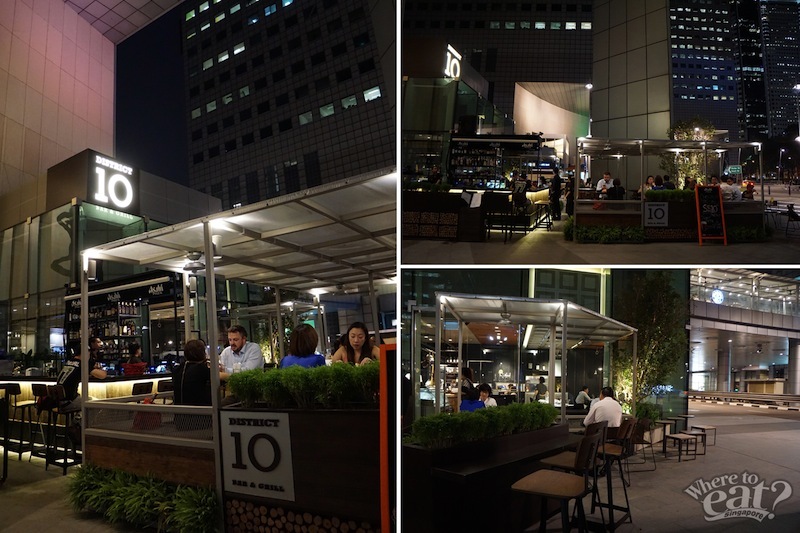 District 10 Bar & Grill Suntec City Tower 2 is near to the taxi stand and facing the fountain. 4 Great Places In Singapore For A Different Valentine’s Day! No Signboard’s Hawker QSR – The Real Nasi Lemak Burger at Singapore’s First Hawker-Themed Fast Food Chain?? Copyright © 2012-2019, WhereToEat Singapore.